HIS Radeon graphics chips and Windows 7 graphics driver draws Windows incredibly efficiently - helping to save system memory and enable a superior Windows experience. The Windows 7 Aero desktop was designed using the DirectX 10.1 API, for which ATI RadeonTM HD 4000 and ATI RadeonTM HD 3000 Series of products provide full support. Besdies, they fully supports the new Direct2D API - enabling enhanced 2D graphics features, and anti-aliased text to make applications running under the Windows 7 desktop look amazingly smooth and readable.
" ATI Radeon graphic is the FIRST and the ONLY graphic product offer the full support of Windows 7, with clear performance and stability leadership." The latest ATI Catalyst drivers for Windows 7 enable a rock solid WIndows experience, full WDDM 1.1 WHQL support, regular performance and feature updates every month, and ATI Stream support. It ensures smooth DVD and Blu-ray video playback in high-definition displays. The power usage is vastly improved to enable higher power efficiency. ATI CrossFireX technology is the ideal solution for Enthusiast gamers to deliver Incredible Windows 7 gaming performance. ATI CrossFireX technology enables improved performance by using 2, 3 or 4 GPUs to accelerate 3D applications. Performance scaling often various per application, but in many cases users will see performance up to double (with 2 GPUs using ATI CrossFireX technology in dual mode) and sometimes even up to triple (with 4 GPUs using ATI CrossFireX technology in quad mode). 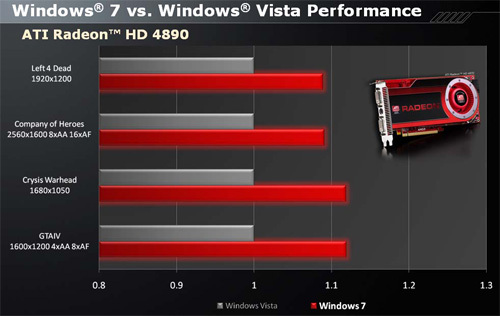 The charts below show Windows 7 vs. Windows Vista performance on a system employing ATI CrossFireX technology.